Memorial Day reminds us to take pause and give thanks for the men and women who serve our country. Many of my family members have served and are still serving today. This layout commemorates my most recent visit to my father’s grave in Arlington National Cemetery. 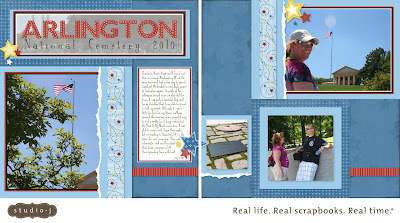 I’m spending my day scrapbooking the memories that matter most, and I want to share this amazing hobby with you. Starting today through the 31st, if you place an order on my website, you will receive a grab bag of CTMH goodies from me! Spend $10-24.99 and earn a $5 grab bag of embellishments. Spend $25-49.99 and earn a $10 grab bag of embellishments. Spend $50+ and earn a $50 grab bag of embellishments, papers, and stamps! I’m cleaning up the craft room and making way for new product, so this is good news for you! Also, don’t forget that when you spend $35 from the current Idea Book, you may purchase the Dotty for You kit for $5. Spend $50 and purchase the SOTM for $5. This Memorial Day Grab Bag Giveaway will end at 11:59pm MST on May 31st, so visit my website today! I’ll send your grab bag goodies on June 1st. Speaking of June 1st, that is the start of the CTMH Stampaganza…buy 2 stamps and get 1 FREE! I suggest you purchase paper, inks, embellishments, albums, page protectors, tools, Etc. this month and wait to purchase your stamps next month for the special deal!